At this year's Paralympics in Rio de Janeiro, Brazil, the U.S. wheelchair racing team will be sporting some especially stylish equipment. Their chairs have been redesigned by BMW's global creative consultancy DesignworksUSA for a faster, sleeker, and more comfortable ride, Fast Co. Design reports. Because they don't have the same branding potential as bikes or running shoes, there hasn't been a lot of money invested in Paralympic athletic gear compared to that of other sports. This means racing wheelchairs are slower and less user-friendly than they ought to be. 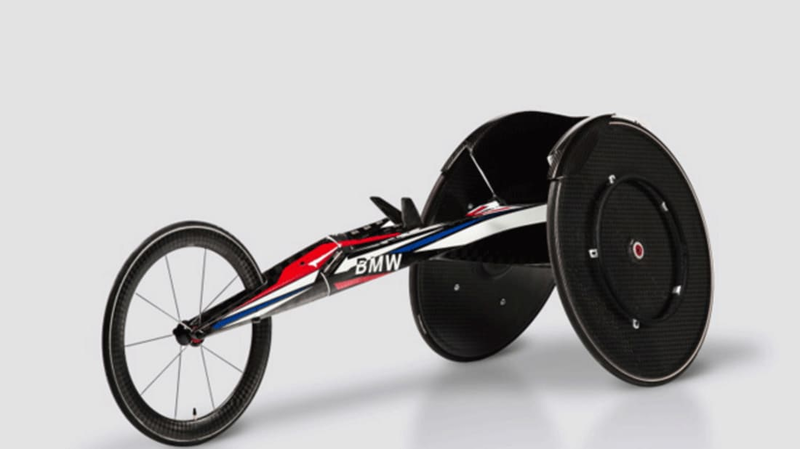 To make the U.S. team's wheelchairs more comfortable, each team member will be scanned and receive tailor-made seats fitted to their bodies. They will also be given custom gloves manufactured with a 3D printer. The new wheelchair's frame is made from carbon fiber rather than aluminum, which results in a sturdier, more balanced ride. After making small adjustments to the shape and angles of the frame, the designers were able to cut the chair's drag by 15 percent. Though Paralympic technology may be progressing more slowly than it should be, it's still come a long way from when it first began. Sixty years ago, racing wheel chairs weighed three times what they do today. And now thanks to BMW's new innovations, we may see competitors race faster than ever before when the games commence this September.